An engineering firm had a new process that required the removal of a coating of insulation. It was important not to heat the material up too much, as the tin-coated copper might then melt. They turned to THE LAB at Ambrell to develop a solution that met these requirements. 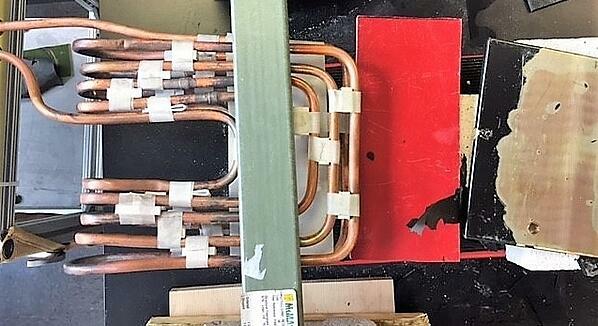 THE LAB determined that an EKOHEAT® 50 kW, 15-45 kHz induction heating system would work well for this application. They designed a single position multiple-turn channel coil. A 7.5" x 4.5" (191 mm x 114 mm) area of the tin-coated copper required heating. After applying temperature indicating paint to the part, it took 35 seconds to heat the sample to temperature. The coating was then removed from the tin-coated copper plate. Heating longer length bars would increase the heating time by 10-15 seconds due to conduction losses. THE LAB confirmed the viability of the application as the part heated quickly for coating release without melting the tin-coated copper. Induction's precise heating, speed, repeatability and the expertise of THE LAB led to the success of this application. To learn about more applications tested by THE LAB at Ambrell, visit our website.